Gardening is one of the ‘a must activity’ when spring approaches and leaving the winter behind. This is the time where we take the opportunity to start gardening and complete it as soon as possible due to its weather not too cold and not too hot. One of the popular flower gardening is the growing of roses. But when to start ? 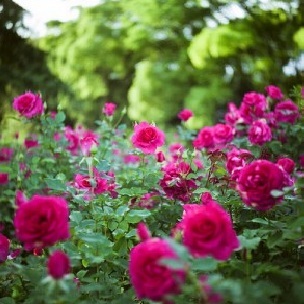 If you live in an area where spring appear in March , then you can start rose gardening early. But if there is still icy rain and snow, then you have to wait for your turn until the spring arrive. Rose gardening is best started during early spring where you have enough time to see the beautiful buds sprouting almost every day. If your roses has been covered with dirt or mulch, you have to remove those dirt or mulch gently to allow those bushes expose to the spring sun and rains that will come each days and nights. Cut back those dead and damaged canes that does not survive during the winter and it should be done before you start your spring pruning activities. All those debris and residue, if any should be cleared from around the bushes too. Add some organic compounds to the soil to nurture your plants . You have the alternative to it ,either get a pre-packed organics from any garden supplier or you can prepare it using your own recipe using composted manure or mushroom compost . The soil may become too compacted during the winter and you can know this when there is standing water after watering your plant . Use a spade or hoe to loosen the soil. Roses require a well-drained soil to better growing. Once those soil preparation is completed, then you can plant any new additions at your garden if any. It is time to start your fungicide spraying. You can start it immediately or you can wait an average 14 days after you complete your pruning. It is recommended to rotate spraying with different fungicides throughout the year so that no fungi become immune to any one anti-fungi product. Avoid using pesticides unless you can see any damages to the trees . Watch for aphids which normally appear during spring . Just hit them with a blast of water to remove them or apply insecticide in a mister to those affected areas. Your roses need to be feed just like you feel hungry after few hours of sleeping. It need to be feed now and every other week throughout the remaining growing season after it long winter hibernation. You can feed them with a balanced fertilizer comprised of Phosphates, Nitrogen and Potash. Nitrogen will stimulate the growth of leaves and canes and increasing the size of bushes. Phosphate help in the growing of roots, canes and stems and does expedite the flowering process. Potash support the production of top quality blooms and improving drought and disease resistance of the plant. That it, your rose gardening is completed for spring and now you should start to think how to preserve it in this coming summer as it is not that far behind.